These are harmless, beautiful creatures which were very common in Jamaica until the mongoose were brought here to eradicate snakes and rats on the sugar estates. The mongoose however, ended up hunting and feasting on the Iguana as well. They then retreated further inland and were not discovered again until 1990.. 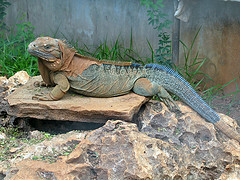 The Jamaican iguana's, Cyclura collei, is derived from the Greek words cyclos meaning "circular" and urus meaning "tail", after the thick ringed tail characteristic of all Cyclura iguanas. Its specific name Collei is Latin for the word "hill" and refers to the regions in which it was once found in Jamaica. They can grow to a length of up to 16 centimeters. They are green/brown in colour with a long tail and can camouflage themselves to match their surroundings. This is essential in protecting them from their predators. They have a comb-like horn starting at the top of their head and running all the way down to their tails. The outer skin is scaly and tightly muscular and has hints of yellow/dark-green in different locations all over it. It has a yellow/orange sensor under its neck which retracts inward and is used to test the temperature and to feel out its environment. It also has a long split tongue which it uses much like a snake does to taste and feel for food. They are herbivores so they feed on leaves, flowers and fruits and occasionally small insects such as grasshoppers, flies and snails. They live in nests of up 20 Iguanas per nest. At nesting time, the female digs a hole in the ground (in an area where the sun can directly warm the ground) and fills it with dried leaves. She then lays her eggs in the hole and covers it up and leaves it. Eggs are laid in amounts of up to 20 eggs per laying. 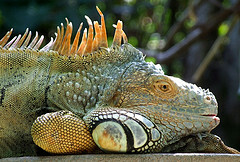 It takes on average 2 ½ months for the eggs to hatch and during this time, the female iguana vigilantly guards the eggs. She will snarl at and chase away any threat she sees to her eggs including the advances of the male iguanas. The eggs then hatch all at once and the young iguanas dig their way out of the ground. They are then left to fend for themselves leaving them open to becoming prey to a lot of predators. It is survival of the fittest for them. They spend a lot of their time on rocks in direct contact with the sun from the time they are hatched straight to adulthood. It was once found across Jamaica, but now The Hellshire hills area in St. Catherine is the only area of Jamaica that the iguana can be found. The Jamaican Iguanas are an endangered species and are being protected by the efforts of the Natural Resources Conservation Authority under the Wild Life Protection Act. Based on research, it is believed that there are less than 200 left on the island. Hopefully all Jamaicans will endeavour to keep them safe.